The latest chapter in a saga of spiralling bills and missed deadlines surrounding the World Cup in Russia. The new World Cup stadium in Saint Petersburg was meant to boast a state-of-the-art pitch and be a showcase for Vladimir Putin's Russia, when it hosts the 2018 football bonanza. 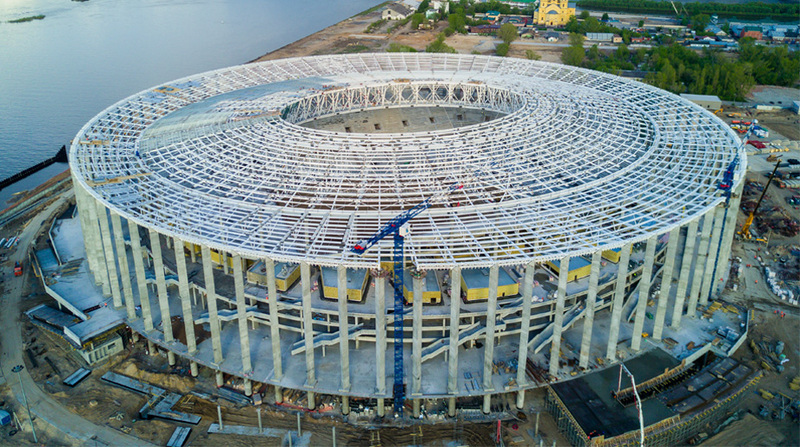 Instead the $800 million venue, which took a decade to build, has caused more embarrassment than pride as Russian authorities scramble to salvage its pitch less than a month before it hosts the opening match of the Confederations Cup, a World Cup warm-up tournament. Uprooted chunks of turf and bald spots on the playing surface in the first match in April at the 68,000-seat arena — a 2-0 win by home team Zenit St Petersburg over Ural Yekaterinburg — sparked concern that the stadium would be unsuitable for Russian Premier League matches, let alone the 2018 World Cup. While officials played down the situation, the stadium received wide-ranging criticism including from Zenit manager Mircea Lucescu. Now, less than a month before Russia face New Zealand at the venue on June 17, workers have begun replacing the turf in a desperate battle against time. It is the latest chapter in a decade-long saga of spiralling bills, missed deadlines and scandal surrounding the World Cup in Russia. "We were supposed to receive a fairytale stadium, the best in the world, in ideal condition," opposition firebrand and anti-corruption campaigner Alexei Navalny said in an April video post. "It was one of Russia's most important construction projects, and money was stolen nonetheless." In 2016, the former deputy governor of Saint Petersburg, Marat Oganesyan, was arrested over a fraud scheme with a firm that was supposed to provide the stadium with a video scoreboard. Even before the issues with the grass, problems with the stadium's retractable pitch made the playing surface vibrate and threw doubt on whether it could host games. Then when officials gave the go-ahead for Zenit — eventually expected to move into the stadium — to play games there, even those trial attempts had to be abandoned. After just two of three planned games authorities and football officials moved the team's May 17 match against FC Krasnodar to the club's old Petrovsky stadium to "save the grass from extra wear". In an interview with RBK business daily in April, Zenit's chief agronomist Konstantin Kreminsky blamed Bamard, a Russian company hired to deliver the pitch. Kreminsky said that the pitch had been poorly prepared for Saint Petersburg's unforgiving winter and that there had been "fungal diseases" and "a lot of mould" on the grass in late February. A Bamard representative said the company fulfilled its contractual obligations when delivering the pitch in the autumn and that FIFA approved it. The problems came later, he said. "Maybe in the spring there were conditions that didn't allow for normal grass to grow," he said, without giving his name. "Maybe they held matches, training sessions… That's also why issues about the field should be brought up with the ordering customer — and not the contractor who delivered the goods." The Saint Petersburg stadium is not the only Russian football venue that has experienced problems with its pitch — with much blame heaped on the country's harsh winter. Manchester United boss Jose Mourinho decried the pitch in Rostov for their Europa League match against the local team in March. "It is hard for me to believe we are going to play on that field — if you can call it a field," Mourinho thundered. In response the Russian Premier League closed the stadium until the pitch improved. It reopened two weeks later. Bulat Litvinov, the commercial director of the Kazan Arena, another World Cup and Confederations Cup venue, said that Russia's inhospitable climate and its domestic league schedule that stretches into the winter could be the culprits. "Let's speak honestly. Russia's climate is not favourable for growing natural grass," Litvinov said during a visit of the Kazan Arena. "And the Russian Premier League schedule is not the most convenient because there are sometimes matches in early December in sub-zero temperatures and snow and the first matches start in March." Although the pitch at the Kazan Arena is now in good condition, the venue went through five pitches in three years, Russian media reported.